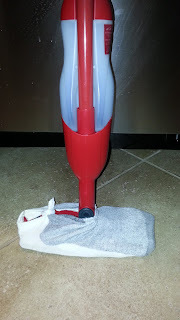 Fit Fluential Mom: Socks on a Swiffer? As a mother and wife, I make it my priority to make sure my family is taken care of and my home is clean. The clean part seems to be the most challenging of all, however, because it seems like there is always something to clean! The floors, mirrors, shutters, bathrooms.....it's exhausting and I find myself constantly trying to come up with ways to do it easier, faster and better. Today, as I was about to clean my floors, I went to grab the usual rag or towel to put around my Swiffer. I've found that the Swiffer pounds are too thin and ineffective. They push around the dust on the floor but don't pick it up as well. Beneath the towels I was going to grab were tons and tons of pairs of my husband's old, stretched out socks. I use those to clean the shutters and put Armor-All on the car tires as well. That's when an idea was sparked. Why not use the socks on the Swiffer and clean with that? Those are thicker, absorb more and can be washed so I can use them again and again! This will not only save me time, it will also save me money on the costly Swiffer cleaning pad replacements. I put the sock on the Swiffer and cut one of the ends a little so it would fit all the way across the cleaning pad. I then tied the end that I cut and the sock fit securely on the cleaning pad. I used an ankle sock but a tube sock may be best since it's larger and can be doubled it. Let me tell you, it worked amazingly well and held up as I cleaned my entire 2600 sq ft house with hardwood and tile floors. This is one idea that I thought of, put to use and am happy I did! So You Want A Mermaid Tail?